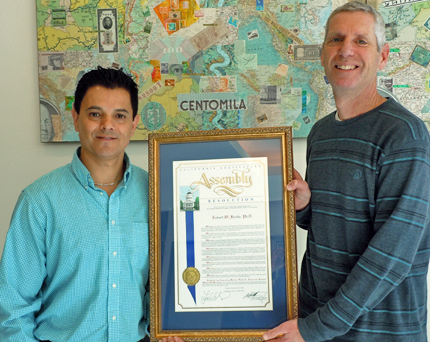 Rob Fairlie, chair of the Economics Department at UC Santa Cruz, right, receives a copy of the California state resolution from Javier Gomez, a representative of Assemblymember Luis Alejo's Salinas office. Monterey Bay Area Assemblymember Luis Alejo and state Sen. Bill Monning issued a joint resolution lauding Fairlie for his involvement in projects on entrepreneurship and small business training, and providing access to technology for students in middle school through community college. A representative of Alejo’s office presented Fairlie with the resolution this week. Tuesday, (February 3) Fairlie is scheduled to speak at UC Center Sacramento on two recent research projects that examine the relationship between community colleges and human capital. One study looks at whether providing improved access to computers could help low-income students on financial aid perform better. In the other, he examines whether underrepresented minority students perform better when taught by underrepresented minority instructors. Fairlie has testified before the U.S. Senate on how the lack of access to capital affects minority business owners and the widening wealth gap that results. In September 2013, Fairlie testified in Sacramento in favor of a bill by Alejo to raise the California minimum wage. The bill passed, raising the state minimum wage from $8 to $9 an hour last July. It will increase to $10 an hour in two years.